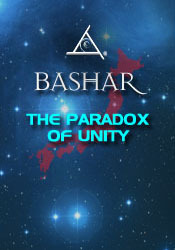 Bashar describes the paradox of unity, exploring how expressing your uniqueness provides support for the whole planet. Channeling other Essassani beings--tips on channeling. The true meaning of relationships. What it feels like to be your true self. Finding your most exciting work. Communication with the Essassani civilization. Searching for your highest excitement. How to trust when you feel fear. When can we meet Bashar? Why did Bashar choose Darryl?